The Draw Smooth Tolerance slider applies a smoothing effect to sharp edges of this 3D object. Higher values apply this effect to a larger portion of the object. This slider has no effect on the object’s true geometry, only on how it is drawn on the canvas. 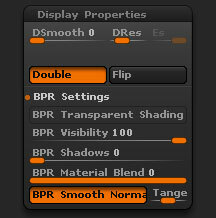 To apply a smoothing effect to the object’s polygons, use the Smooth slider within the Deformation sub-palette. The Draw Resolution slider affects the way the current 3D tool is drawn on the canvas. Depending on the number in this slider, polygons will be added or reduced before rendering the object. This button only affects the object’s appearance on the canvas, and does not affect its true geometry. Polygon dividing, which does alter the object’s geometry, can be performed using the Divide button in the Tool:Geometry sub-palette. The Edge Smoothness slider, active only when the Smoothness slider (left) is higher than 0, applies a smoothing effect to any sharp edges of this 3D object.